I get asked to do things by people. For some reason I get drafted to do a fair amount of heavy lifting. Sure go ask the 6'4" guy, 193 CM, he'll do it. Well I did whine a bit, probably more than I should. Ok, Ok, a lot more. I'll shaddap. This was for a very good friend who has done quite a lot for me. I have helped him and his company out a lot in the past with technology issues, as well as this sort of thing. Sometimes it even goes both ways like the time I installed a power battery backup for their servers. Bolted that right into a cabinet. I had to do the same thing for the company I was working for very shortly thereafter so it was nice not to have to use my own responsibilities as a guinea pig for that sort of thing. I will call it on the job training. I was told that mine later had to be cut out of that rack because batteries in a power conditioner and battery backup have a nasty tendency to swell. Given about three years, swollen batteries will warp the case and lock everything in place in the server rack. Get out the tin snips, it looks like a giant iPhone blew its battery pack. That day was simpler. Get a small refrigerator to the roof of the office block and leave it open to allow it to drain. Come back the next day. While I was waiting for things to settle and get ready, I was invited to a cup of what I call Office Coffee. That's appropriate since I was the taste tester for these things. One sip and "It doesn't taste right. Your water temp is too high. It's bitter". Office coffee has a bad reputation but any bitter coffee can taste better by reducing the brew temperature. Don't even get me started with Starbucks, I won't drink it willingly. I have had this exact Kona blend before but I made it with my French Press. Bring water in a kettle to a complete vigorous boil. Wait 20 seconds, no less, for the kettle to cool to the correct temp, then brew normally. Ahhh, coffee nirvana. But this was ... wanting. There is a coffee company in the London that brews at 92C to 93C if you are looking for exact numbers. I do it by waving my kettle in the air for 20 seconds. I finished the brew, then we went upstairs. With the refrigerator. And my hands slipping and sliding the whole way with my mind repeating "I Think I Can! I Think I Can!" Truth be told it wasn't so horrible, and the view up there was quite nice. Coffee or the heavy lifting both. The city centers of South Florida from Jupiter through West Palm Beach, Fort Lauderdale, and Miami are in discrete pods. If you stand in the right place they line up like you would waiting in a queue. Plop! There's downtown Miami with Miami Beach next to it. A little ways North is Aventura. 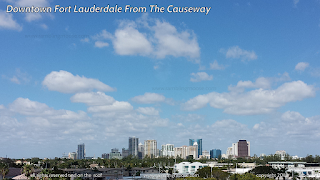 A little further is Hallandale with its massive towering condos packed too closely together. Hollywood, then downtown Fort Lauderdale and the Beach behind it. That day was brilliant, beautiful, and breezy. 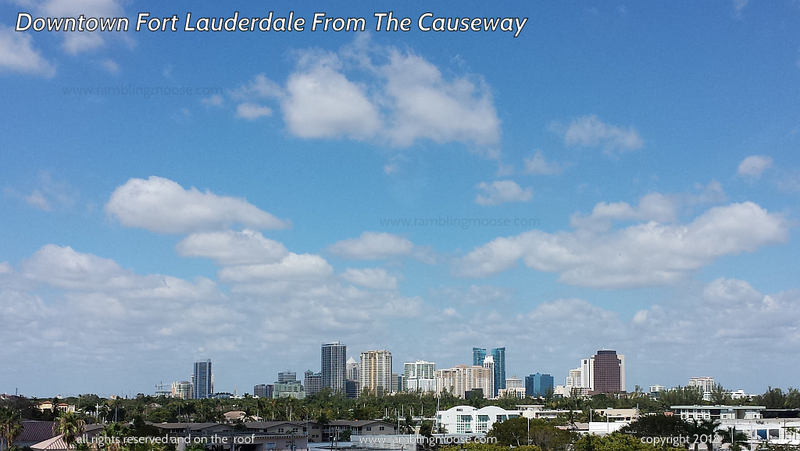 Fort Lauderdale shined in the sun, becoming a playground once again for the sun worshipers. A couple miles away over the palm trees it rose above the squatting homes below the tree line. And all I had to do was help move an office fridge to get to see it. Rather a nice bargain if you ask me. The next day we moved it back downstairs after we chased the mosquitoes that colonized the water dripping from the little freezer in that short time. Taking a sip of coffee, I commented "If you can, drop the temperature in this coffee machine a few degrees. It will taste better." The look I got I think was a bit disbelieving but I know if it happens, I'll get a report back. Don't overheat your coffee while brewing. You may end up on a roof with a story to tell.